Thoughtful readers can transform desert-like blogs into decadent desserts. If you maintain a blog, you probably remember the first time you filled up a draft page then hit publish. Perhaps you worried that no one would read your post—or that everyone, including your mother-in-law, ex-boyfriend/girlfriend and neighbor you pissed off, would. In either case, I bet you felt a rush when comments and subscribers trickled in. (Well, depending on the comments… ;)) Your readership has probably grown since then and with it, your appreciation. When Raani York nominated me for the Reader’s Appreciation Award, I was giddy—and not just because she’s a terrific gal. Any chance to say THANKS to readers is well worth it. First I thought I’d share the makings of a thoughtful reader and the super perks of being one. …read, rather than glimpse at, posts. …choose and read posts with titles or topics they’re intrigued by or care about. …post genuine, heart-felt or hilarious comments. …share desirable blog links on community sites, like Facebook, Twitter, WANA International and Google+. …subscribe to blogs they enjoy. Fun, inspiration and education: With the many millions available to us, it’s not difficult to find blogs that strike our funny bones or hearts. We can learn about animals from Amy Shojai, glamping (glamour + camping) gear from Natalie Hartford, surviving a creative existence from Chuck Wendig and building online communities and platforms from Kristen Lamb. Doing research for a new novel? Why not seek out blogs related to your topic? Yes, we should keep in mind that we’re reading blogs, not textbooks or the New York Times. But you know what? I’ve learned a heck of a lot from blogs and blogging friends. Friendships and community: We can make friends, and not merely with the bloggers we follow. I’ve encountered fabulous new blogs I read regularly now, after admiring their thoughtful comments on others’ posts. Our comments could spark conversations, inspire more blog posts (hopefully with proper credit ;)) and gain attention from readers throughout the web. You just never know who’ll read your comments, follow you on Twitter or “Like” you on Facebook in response to your thoughtfulness. Reciprocation: Supporting others through thoughtful comments and shares tends to bring that boomerang directly back. It’s not the main reason we should read and support blogs in my opinion, but it’s definitely an added perk. The more we give, the more we’re likely to receive. I’d love to give this award to all of you. The fact that you’re reading this warms my heart. 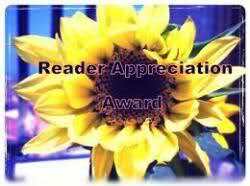 Please feel free to carry Reader Appreciation on via your blog. I’ve also selected a handful of recipients to highlight. As you’ll see, thoughtful blog commenting and fantastic blog writing go hand-in-hand. Coleen Patrick: Read. Smile. Repeat. I’d love to hear your thoughts. What do you love most about blog reading? Have you been surprised by readers’ thoughtfulness (or lack thereof)? Do you consider yourself a thoughtful blog reader? Why or why not? Aww, thanks for the shout out! I always enjoy reading your blogs–and there are some here I need to revisit. Blogging has connected me with some of the most awesome folks who I otherwise never would have met. Love this. You are trulybleadingband inspiring and writing with your heart! Thank you! Thank you! I really appreciate the award. I love reading your blog, and your thoughtful comments on mine are always awesome. I can always tell that you’ve read the post and taken time to think through a response in a genuine way. I’ve always really appreciated that. That means a lot, Lisa. Thanks! The feelings are definitely mutual. 🙂 I feel like our blogs are mirrors and extensions of us—holds true in your case for sure. Thank you for passing this award along to me! I agree with everything you wrote about great readers. Some of the people who read my blog really do make my day with their comments. Even when they disagree with me, it makes me think. The friendship and community you mention are a couple of the reasons I prefer blogging over having a newsletter. I think people enjoy reading others comments on a post they enjoyed. (I know I do because I’m as interested in hearing other readers’ responses as I am in the post itself if the topic hits home with me.) In a newsletter, you’re only connected to the writer and not to all the other readers. While that privacy can have benefits, it also means there’s no community of people building friendships and getting to know each other. I love getting genuine comments from my regular readers and, these days, in addition to responding, I’m really making an effort to get over to other people’s blogs when they show up at my place so I can reciprocate and see what they’ve got going on. I really enjoy the community apect of blogging the most. Who wouldn’t? I also think you picked some lovely people to highlight. Except for that slightly awkward part where I thought you were a GUY. D’oh! But our hotness will keep up bonded for life. How are your teeth? AWWWWW first thank you for the fab shout out and for honoring me with this award. It delights me to no end! Stellar topic August and so timely. Hubby and I were just talking about time management with the number of blogs I try to stay current with and one suggestion was to “skim” more and comment less. And this made me realize that my priority is quality over quantity. I would rather read a smaller number of blogs than sacrifice being a thoughtful reader and commentor. Mostly because that is just who I am. Even when I try to skim a blog, something catches my eye and before I know it, I’m reading the entire thing with keen attention. And to not comment when I have so much to say?!?!? Impossible! LOL!! Also, I appreciate it when people take the time to read and comment on my own blog. It warms my heart so I want to pass that love along. I try to live by the motto, do onto others as you would have them do on to you…. So with that….I do consider myself a thoughtful blog reader. I do LOVE blog reading. There’s just so much goodness out there, people sharing their stories, funny, touching, inspirational…it’s all there for the reading enjoyment. I’ve been most deeply touched and honored I think by comments on my impaired driving posts. The level of support, love and friendship that I’ve found in the blogosphere around this topic has totally surprised me and continually moves me to tears….my heart overflows with joy and appreciation…I mean, it just blows me away! And it has…I think…helped my family heal and feel a sense of pride out of such a tragedy. To know we’ve assembled an entourage of supporters around the WORLD in Mamma K’s memory is just…more than we could have ever imagined! Of course, I love the comments on all my other posts as well, especially when people share some of the funniest bits about their life. Love it! Blogging has just opened up this huge new world of incredible virtual friendships and family that I had no idea existed…it’s been the best surprise and blessing. My blog continues to thrive, thanks to your help and guidance. Much appreciation, BG! Great post, August. I just retweeted the tweet that helped me find it. I especially liked the quality over quantity point. If it isn’t worth reading, why skim it? Well said, Kassandra. And thanks for the support! Thanks so much for the inclusion August and congratulations to you! You have made some great points. I think the blogging community is a wonderful place to come for support and sharing ideas. I am so glad that you are a part of it! Lovely post and great choices, August! Lovely post, August! And I’d have shouted out close to that same bunch. 🙂 They’re awesome sauce wrapped in a fuzzy sweater. It’s so true! I know there are people reading my blog that I never hear from – and that’s okay. I know how full my blog reader gets and I simply CAN’T say something meaningful (or even anything) on every post of every blogger I know. But I still love hearing from readers. And I try to be that kind of reader on the blogs I enjoy – even if it isn’t as regularly as I would like. Thanks for being one of those readers/bloggers! A beautiful post, and a wonderful gesture! Your inner light always shines bright through your awesome ability to share your love in words everyday through your posts! I really enjoyed it! Thanks for the blessing! I love reading my favorite blogs. I learn so much, meet new people and connect in a way that wasn’t possible before. I love your blog August! August, your posts always abound with your love an inner light. Thank you for sharing that with us. Like Kourtney said, I am in awe at how you manage to visit and read so many blogs all the time. You truly are an inspiration. Thank you for including me on this precious list. I’m blessed to have met you and be part of your life. Well, it seems to you and Kourtney that I read and comment on tons of blogs, because yours are two of my favorites! 😉 I wish I could read more, but like others have said, we only have so much time. Thanks for providing quality content worth reading. I really do look forward to your posts, Debra, and learn about topics I might not otherwise. I agree with you, too – as I often do — it’s about community and support. I can’t visit as often as I used to, but I always try to visit those who take the time to comment. I try to “blog walk” when I can — I often think I’ll delete my twitter account and a few other social networking doo-dahs and leave only my blog and FB so that I have more time. LOL See??? It’s comments like this that make you so darn lovable. No one expresses themselves quite like you, Kat. There are so many good blogs out there, it’s hard for me to limit my reading, as Natalie mentioned. But it is truly quality over quantity. thanks for another great post. I personally think it’s very important to read as many blogs as possible but not “overdo” it, than just “glimpse” at a hundreds of them, as you mentioned it. I personally enjoy a well thought and well placed comment much more than one I think was placed and copied to another 100 blogs as well. Thank God I do have GREAT readers who I never had the feeling they would do this. I personally just promised myself to concentrate on what I like! And you know August that yours is one of my favorite!! I think you set a really good example for thoughtful reading. And I like the blogs you highlighted (at least the ones I’ve read, and I’m going to try to visit the other ones). You know, I try to be a thoughtful reader, but I do find myself getting time-crushed. Often I fear leaving an insipid comment, and too often, I can’t leave one at all. As far as the advantages of reading other blogs . . . I think creativity can be increased through collaborative efforts, and passion for writing tends to spread when shared. Lovely gesture, August! I am too grateful to the readers of my blog. I had a particularly hard day last week, and I went back and read the supportive comments on a past post. It warmed my heart and helped me regain my confidence. I have been blogging for about 10 months and I’m still amazed at the interactions and relationships and conversations that abound. I thought it would be more difficult to get in the groove of being a ‘responsible blogger’ (as I’m pretty much an introvert), but it wasn’t hard at all. I have had a lot of fun, I have learned a lot, and I have even changed/grown as a person. I’m not quite so intimidated anymore by random conversations or small talk at cocktail parties (okay, they’re really PTO meetings, but the end result is the same!). I have a couple of pet peeves about blogging, or rather, commenting on blogs. I feel the need to vent. First – I don’t like it when people send me an e-mail saying how much they liked my blog but didn’t post a comment or hit the like button on the blog. Seems strange to me. Just tell me in a comment. Maybe they’re in the witness protection program or something although one gal does it to me regularly even though I always post a comment on her blog. I just don’t get it. Second – I don’t like it when I post a comment on someone’s blog and they don’t reply to the comment. Sometimes I visit blogs several days after they’ve posted, but I still leave a comment. I find that a lot of bloggers won’t go back and check their blogs after the first few hours after they’ve posted. I visit blogs to support my fellow bloggers, to make cyber friends, to build a community of supportive followers and for just the shear entertainment value. Some people are very funny. And most people have wonderful lives that they share on-line. I love learning little tidbits about my followers and the people I follow. I have a fair amount of readers who do e-mail me their comments rather use the comment box on the blog. While I’d love to see those comments on the blog too for stats purposes and group discussion, I’ve started to realize that in today’s fast driven technology world, people will use whatever medium they’re most comfortable with. And it’s all in how you think of it. I figure, it took them longer to read my blog and then pop into email and send me that message. But whatever/however, I’m grateful for it. Oh don’t get me wrong, Jess, I do appreciate that they’ve taken the time and extra time to visit and let me know they did, it just seems like way too much extra work. But I agree, some people are more technology challenged than others so they stick with what they know. I love this post! I can clearly remember publishing my first post – my heart was pounding! I love your blog and I read your whole post, not just the headline. I am a very visual person however, I find that I like it when my fave bloggers get personal. I read comments too and if someone puts a great comment up, I’ll probably hop on over to their blog because it’s probably worth reading. I’m so surprised at some of the comments that are on my blog. Everyone so far is so supportive. I’ve watched their blogs progress and change. Theirs are evolving into greatness. So, I do feel like I am a mindful reader. And if I like a post, I’ll comment on it. I try to be a good thoughtful blog reader. I always leave a comment and do my best to visit those who visit me. My biggest challenge? Time, especially this summer with all 3 kids home. But the writing blogger community is very supportive and I really love visiting daily. Great post. Love this post, August, although I’ve said that about your last several posts. You’ve had some amazing introspection and dialogue happening over here! Awesome recognition for some great bloggers up there! I see so many names I recognize and undoubtedly wish I got to more, but I do my best each week. I try to remember that on days where my comments aren’t as plentiful as I’d like, that everyone is working on their WIP’s or hit up other blogs for the day, and that’s ok. Gotta spread the love! And this post is bountiful with it! All bloggers should aspire to inspire and entertain their readers. As readers, reading and commenting with thoughtful content is just good manners. I’ve met dozens of wonderful people through blogs and learned so much from so many of them. Congrats on receiving this well-deserved award, August! This post is fabulous! Thank you for the gentle reminder via an unbelievably awesome post. Your blog is definitely a chosen few, and I never regretted that I selected tha ‘follow’ button the first time I saw it. So very well said! I view my blog reading as a form of entertainment or learning, never as something I ‘have’ to do. I think that makes a huge difference in how we read blogs. There are some that make me laugh and others that make me think, but in all they add value to my life in so many little ways. Thank you so much for giving me this award. That you think my comments and my blog are worthy of note, humbles me. As you know, I think your blog is one of the best ones on the internet and I’m proud to call you my friend. Thank you. I’m so sorry I’m late to comment on this. Have been away visiting friends and just getting back into the swing of things. Thank you so much! Regardless if blogging ends up selling a single book, it’s still been worth the time. I’ve made so many wonderful friends and found a support network that is essential for any writer. It’s an amazing feeling to have so many people to reach out to. “We should give for the sake of giving.” — I agree wholeheartedly! Great post, August. I wish I had more time to appreciate all the terrific blogs and bloggers out there! I’m still finding my way around the blogging world, but one I read recently reminded me to enjoy the process of having a small audience. And, actually, I think that is what I’m enjoying the MOST about it so far – making interpersonal connections, and learning about other people through their blogs. Even though I read, I don’t always have something to say, but I enjoy leaving a comment when it’s meaningful. Great blog, August. Oddly enough, my desire to be a thoughtful blog reader keeps me from reading all of the blogs I like. The more people I know and the busier I get with my novel writing, the less time I have to show blog love to all of the other wonderful writers out there. I know I visit less often, but I do try and be a thoughtful reader when I arrive. I decided I would rather visit blogs less often than scan them or just show up to hit the “like” button and move on. It ‘s terribly frustrating. As always, August, you offer us thoughtful and meaningful words to contemplate. The blogging community consists of a wonderful and diverse group of people who have begun to feel very much like family. As everyone agrees, it’s difficult to get to spend the time required to absorb and appreciate every blog we follow. I have to admit that there are many times when I do hit the “like” button and move on after tweeting or sharing on f/b. However, I do that so the blogger will know I was there even if I didn’t have time to leave a thoughtful comment. I would never hit that button without having read the entire post and, indeed, liked it! I feel privileged to be part of this online community! This is wonderful, August. I have also learned so much from reading blog posts. I often find that when I research a topic, I end up on someone’s blog and learn something I didn’t know before. I adore the knowledge, the sense of community, and the entertainment blogs provide.